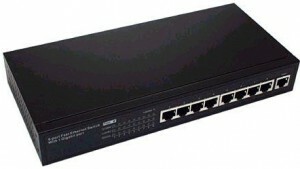 The Dual E-Switch 9 series provide the most economical way to upgrade your network performance to switched Fast Ethernet. They provide 10Mbps and 100Mbps dedicated bandwidths in each port, which is needed by most users for common operations, as well as to relieve serious network congestion, run multimedia applications, or satisfy power users. With the additional Gigabit Uplink port, US4009G is ideally suited for integrating Gigabit Backbone to 10/100Mbps Workgroup networks. The Dual E-Switch series conforms fully to Ethernet, Fast Ethernet and Gigabit Ethernet standards to ensure compatibility and interoperability, and most importantly, these Switches are very affordable to point of price level of shared bandwidth Hubs. Dual E-Switch 9 is housed in a mini desktop case, it comes with internal power supply to meet all market requirements. The Dual E-Switch series provides a comprehensive status LED panel providing valuable network information for ease of diagnostics and troubleshooting.